Slowing sales growth for Hortonworks took some of the wind out of Cloudera's stock last month. 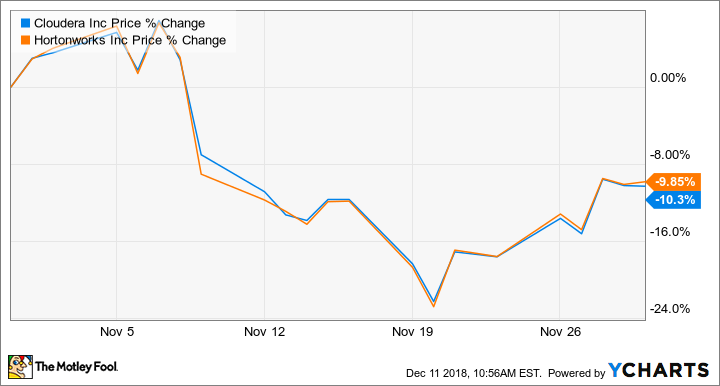 Shares of Cloudera (NYSE:CLDR) lost 10.3% of their value in November, according to data provided by S&P Global Market Intelligence. The cloud services company's stock lost ground after Hortonworks (NASDAQ:HDP) posted third-quarter results. Hortonworks reported its third-quarter earnings on Nov. 8, and the market's mixed reviews on performance in the period and outlook going forward dragged Cloudera stock lower. The two companies have seen their valuations move in tandem after detailing plans to merge the businesses next year. Cloudera and Hortonworks expect to close their merger deal early in 2019 and are unlikely to face regulatory barriers, so it makes sense that the two companies are being treated as a single entity by the market. Hortonworks' third-quarter sales and earnings came in ahead of the average analyst estimates, but evidence of slowing growth and a lack of guidance for the fourth-quarter guidance appear to have increased negative sentiment on both stocks. The cloud company recorded revenue of $87.17 million for the period, up 24% year over year and surpassing the average analyst estimate of $87.07 million. Losses per share for the period arrived at $0.06, well ahead of the average analyst estimate's call for a per-share loss of $0.13. However, Hortonworks was up 40% year over year in the previous quarter, and the third quarter of 2017 saw the company record 45% sales growth, so momentum appears to be slipping for the business. Cloudera reported third-quarter earnings after market close on Dec. 5. Sales for the period climbed 25% year over year to reach $118.2 million, and subscription revenue was up 28% year over year to come in at $99.7 million. The company's adjusted net loss for the quarter arrived at $0.03 per share, down significantly from the per-share loss of $0.17 that it posted in the third quarter of 2017. For the fourth quarter, Cloudera expects sales to increase roughly 17% to $120.5 million and for its adjusted net loss to come in between $0.10 and $0.12 per share, roughly in line with the $0.10 per-share loss it posted in the fourth quarter of 2017. The company is valued at roughly four times this year's expected sales.